Find below information on a new book of essays on Joyce; our colleague, from AEDEI, Teresa Caneda is one of the contributors. Congratulations on this important publication. 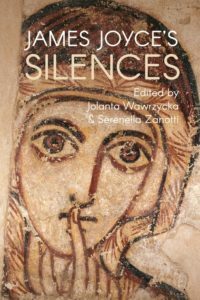 In this landmark book, leading international scholars from North America, Europe and the UK offer a sustained critical attention to the concept of silence in Joyce’s writing. Examining Joyce’s major works, including Ulysses, Portrait of the Artist as a Young Man and FinnegansWake, the critics present intertextual and comparative interpretations of Joyce’s deployment of silence as a complex overarching narratological strategy. Exploring the many dimensions of what is revealed in the absences that fill his writing, and the different roles – aesthetic, rhetorical,textual and linguistic – that silence plays in Joyce’s texts, James Joyce’s Silences opens up important new avenues of scholarship on the great modernist writer. This volume is of particular interests to all academics and students involved in Joyce and Irish studies, modernism, comparative literature, poetics, cultural studies and translation studies. 3. What Happens When ‘Silence Speaks the Scene’?